Though simple and old-fashioned, a kaleidoscope is a fascinating toy: aim the slender cylinder, reminiscent of a telescope, at a source of light, peer into the other end, and slowly rotate it to see the colored pieces of glass or similar small objects enclosed in it form endlessly varied geometric patterns on the mirrors reflecting multifaceted and mysterious images (of the world). 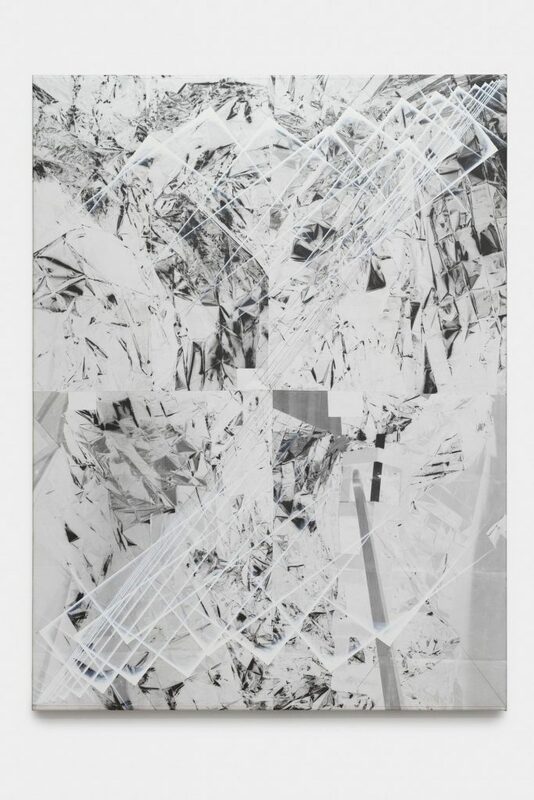 In Tillman Kaiser’s art in two and three dimensions, replication is similarly the constructive principle behind crystalline and geometric forms generating patterns. 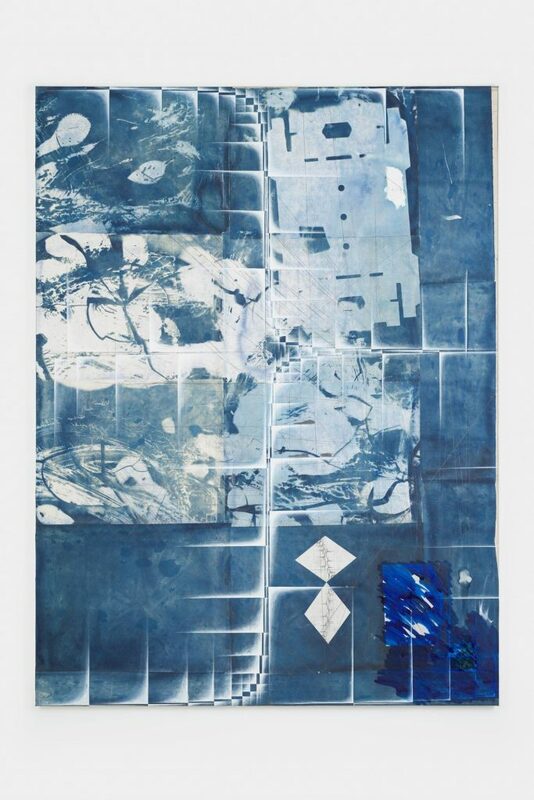 The artist’s creative approach adds to the complexity of the phenomena in question: in his pictures, he melds media such as painting, photography (including, sometimes, photograms and cyanotypes), and serigraphy. In other words, he combines techniques that require preparation and planning and do not generally lend themselves to impromptu expression with painting, a medium in which gesture and the artist’s physical interaction with the canvas read as signals of immediacy, spontaneity, and expressiveness. Kaiser toys with this ambiguity on several levels, making his works scenes of a clash between contingency and planning, conception and improvisation. The kaleidoscope paints a distorted picture of the world but by the same token brings out its complexity. The artist’s emphatic distrust of simple explanations and inexhaustible delight in the enormous variety of the visible world recognizably informs his work. Folding and geometric forms as well as the use of straightforward and “poor” materials are the defining characteristics of Kaiser’s sculptures, objects, and three-dimensional wall pieces. Their sometimes futuristic shapes are also reminiscences of the avant-gardes and early modernism. The reference to avant-gardistic tendencies of the twentieth century is underscored by the artist’s choice of materials: forms folded out of cardboard and paper, sometimes in conjunction with found and repurposed everyday items, lend his objects the ephemeral aspect of models or prototypes. Just as crystalline patterns in prismatic repetition often constitute the compositional scaffolds of the paintings, the sculptures are constructed from reiterated geometric forms. If the kaleidoscope as a kind of interface between the artist and his world is a central trope, so is the camera obscura, the basic pinhole camera. Most recently, the artist has made pictures by exposing abstract geometric forms, some made of folded paper, using a large-size pinhole camera, developing the “photograph,” and then reworking the resulting picture with paint. When defects such as stray light in the camera occur, Kaiser embraces them as traces of contingency and an index of his creative process. An artist who is keen to point out that he should not be identified with what he does, he notes that wit and humor are key elements in his work. For his exhibition in the Secession’s main gallery, Kaiser is working on new camera obscura-based pieces. 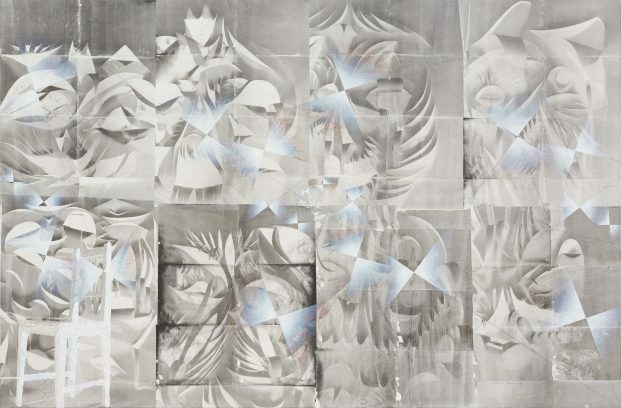 He also plans to realize a site-specific photogram or cyanotype wall installation. Tillman Kaiser was born in Graz in 1972 and lives and works in Vienna.